I booked tickets for London Vegan Beer Fest weeks ago, purely based on the fact that it was hosted by Fat Gay Vegan and involved vegan food. Thankfully, I was not disappointed. LVBF took place on Saturday 18th July at the Camden Centre, King’s Cross. Having never attended a beer fest before, let alone a vegan one, I wasn’t quite sure what to expect. However the queue outside just after the doors opened suggested this was going to be a popular event, with a diverse range of people that all had something in common; a love for vegan food, beer, or both! As I entered the venue, I was handed my very own branded LVBF glass to keep as a souvenir, and of course to fill with beer, which I thought was a really nice touch. The main hall was surrounded by eight breweries serving a range of different beers, but there was also a wine bar, cider and soft drinks on sale for the non-beer lovers. Drinkers could check their tried and tested beer on their beer tick sheet, select their favourite brewery on an online poll and attend ‘meet the brewer’ talks backstage. Luckily, I made my way to get food pretty early on, so the queuing wasn’t so bad for me. But even at this time, the Fry’s staff really had their hands full catering for so many hungry vegans. There was pizza (topped with ‘pepperoni’ and home-made vegan cheese) a selection of different burgers, fries and donuts. To an onlooker, this would seem to be no different from the food supplied from the average burger van at a festival, the only difference being that no animals were harmed in the process. I felt this was a clear contradiction to the idea that vegans live purely off vegetables and salads, it is now becoming better understood that vegans enjoy junk food just as much as meat-eaters, just without any animal-derived ingredients. I’m a big fan of the Fry’s faux meat range anyway, but it was great for other people to sample the products, and perhaps incorporate a new brand into their plant-based diet. By the time the entertainment started on stage a little later in the afternoon, the place was completely heaving, holding some 900 guests. The acts went down well amongst the slightly tipsy crowd, with performances from Grace Banks, Ellis Slater, Love Like Hate and comedian Jake Yapp. Animal advocacy organisation ‘Animal Equality’ were on hand offering information about their work, and handing out leaflets which would have been particularly useful to the non-vegans that maybe came along to accompany a friend. Vegan store ‘Vx’ also had a merchandise stall, and offered a discount at their shop just down the road with LVBF wristbands which showed a sense of teamwork between the different organisations; coming together for a great cause. Throughout the day there was also a screen provided by Eventjoy, where people could tweet their feedback using the hashtag #LVBF15 which kept everybody in high spirits (or beer) while they waited for the next act to alight the stage. 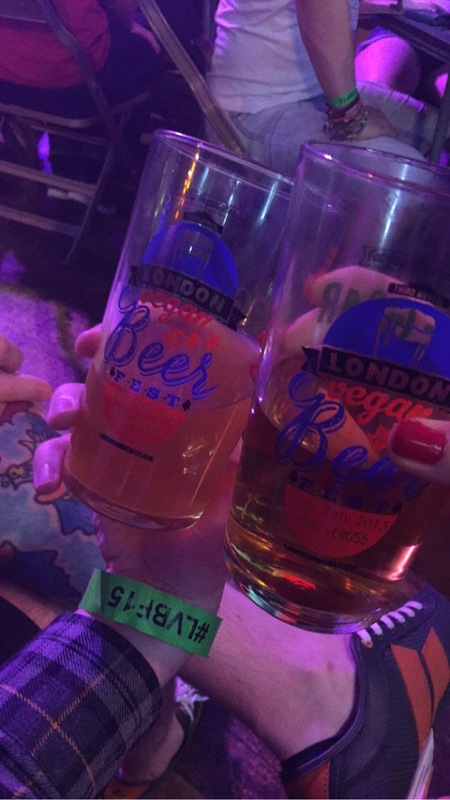 Overall, London Vegan Beer Fest was a great success with a positive and lively atmosphere. I’d like to say a huge congratulations to Fat Gay Vegan for organising and hosting this unique, successful event. The only area for improvement seems to be expansion to keep up with the growing number of people that are attending – more food stalls, merchandise, and acts. But I think this is what’s exciting about it; it’s just going to get bigger and better from here on out. Fat Gay Vegan has catered for the modern vegan perfectly, and I’m already looking forward to seeing what LVBF 2016 holds. Cheers! Next ›Cruel Tradition Finally Ended!